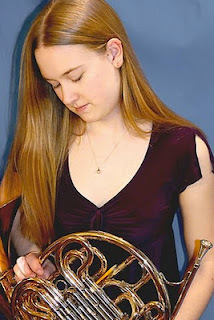 Kathryn Zevenbergen, a Spotify fan who is studying horn at Zurich University of the Arts, emailed me in July to ask me "how much do you pay attention to or value the use of original instruments when you make your playlists", and I confessed I couldn't judge recordings from that angle. That's how I got this idea about guest posts by professional musicians. I asked Kathryn to compile some playlists for her instrument, and suggested to include the slow movement of Hummel's Piano Concerto No.3 (four horns accompany the piano throughout while the rest of the orchestra go for vacation). She just sent me two great playlists with an intro. Here's Kathryn. The Horn Highlights playlist is my attempt to make a short playlist with the best movements written for horn. It has a little bit of everything--obviously there are concerto movements, but there’s also some chamber music. Now, I have to admit, I have a grudge against only listening to one movement of a piece. If you have that bias as well, the complete version of everything on the Horn Highlights list can be found on the aptly named Horn list. This list is everything I can think of, but if you subscribe, I will be continually adding to it, because I know for a fact that it is in no way complete. The Horn list is not in chronological order, I prefer to listen to things mixed up a bit. I also didn’t want to have six Mozart pieces in a row. A couple notes about the horn: the first horns had no valves, and thus could not play a complete scale. Some of the recordings I found are played on similar instruments (such as the Bach Brandenburg Concerto recording), but I couldn't always find historically informed performances performances. You can maybe hear the difference, because some notes will sound with more of a buzz than others. The buzzy notes come from the player moving his/her hand in the bell to cover the hole, and thus the pitch changes, creating a note the instrument shouldn’t actually be able to play (this is maybe most obvious in the recording of Mozart's concerto K. 447). Another cool thing about horn is the amount of chamber music we can play. I didn’t put a whole lot on this list (only my favorites) because if I put every quintet, the list would be about a year long. Horns are very versatile in the chamber music world--although we are a brass instrument, we also play in most woodwind ensembles. Here are the Spotify playlists: Horn Highlights (21 tracks, total time: 2 hours), and Horn (159 tracks, 14 hours) Hopefully these playlists give you a taste for everything horn! Enjoy! Nice list. The finale to the Brahms horn trio is one of my absolute favourite bits of chamber music!